In 1933, Cessna was back in business again, this time with an improved version of the AW, featuring an improved landing gear and a 145-hp engine. This first model, designated the C-34, was possibly the most efficient airplane in its class, and nearly 100 were built. 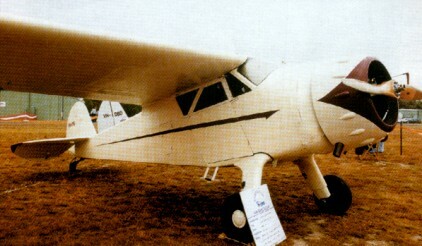 The first production C-34 is sold in 1935. Dwane Wallace, the nephew of Clyde Cessna, as a plant manager at no salary had the opportunity to design, build, test, fly, sell and race the company's products. Wallace designed the C-34, a high-wing, four-place cabin monoplane with a 108kW / 145-horsepower Warner Super-Scarab engine. The airplane retained the fully cantilevered wing of earlier Cessnas but added flaps. In June 1935 the prototype Model C-34 first flew, piloted by George Harte. It was capable of achieving a maximum speed of 261km/h. The C-34 was entered in the 1935 Detroit News trophy race, part of the National Air Races. The trophy race was essentially a test of efficiency and included an evaluation of economy, speed, landing and takeoff handling as well as general comfort and appearance. The C-34 won the day. Forty-two were built, two being impressed for USAAF under the designation UC-77B.